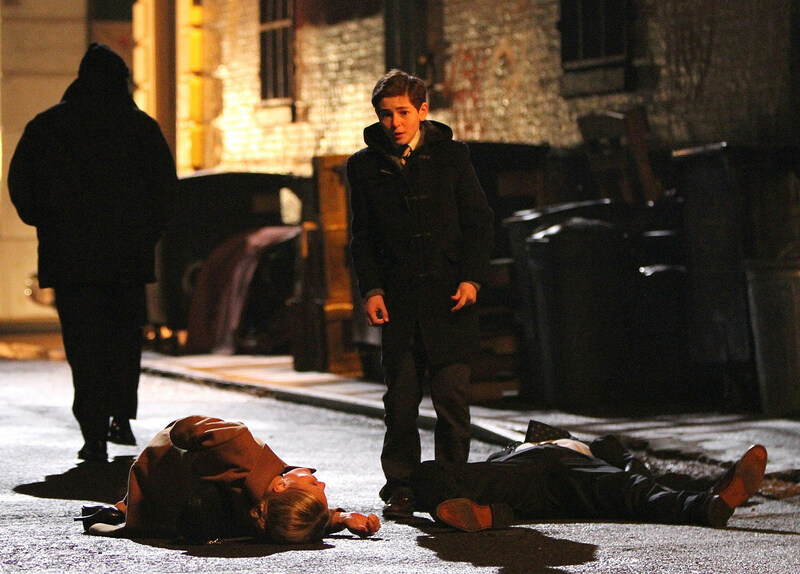 FOX’s ‘Gotham': First Look at Bruce Wayne, Our New Catwoman and a Major Scene on Set! Yesterday FOX's Batman-prequel series, 'Gotham,' released its first official photo in the form of Donal Logue's Harvey Bullock, though recent set photos have already shown the likes of Ben McKenzie's Jim Gordon and Robin Taylor's Oswald Cobblepot. Now, take a first look at David Mazouz's young Bruce Wayne (complete with Bat-mask!) and Camren Bicondova as a young pre-Catwoman Selina Kyle, in addition to a major scene! 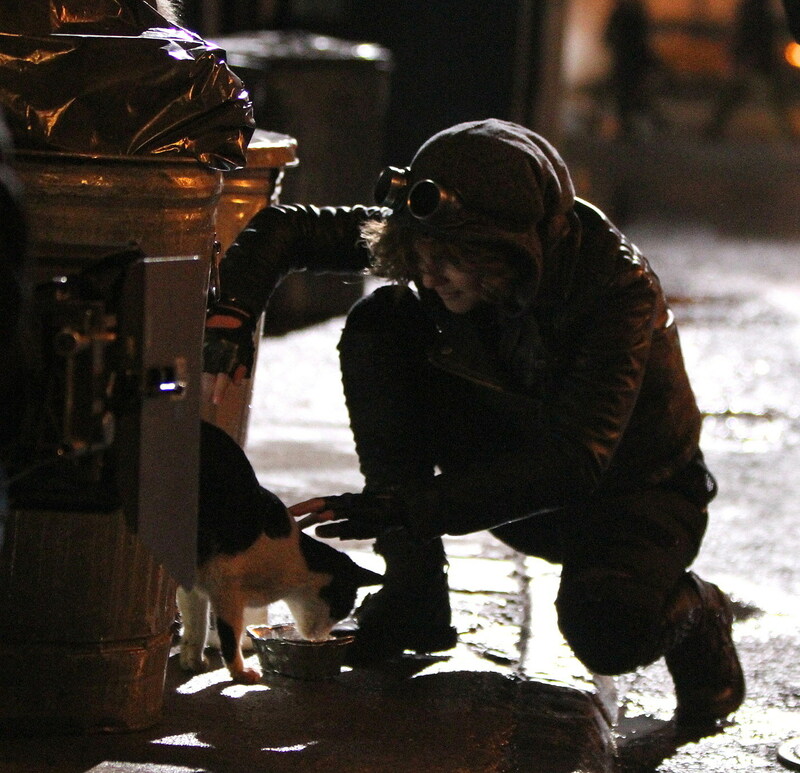 While we expect more official 'Gotham' photos to emerge later on, the first photos of the young pair in action look appropriately reminiscent of their future costumed counterparts, as Mazouz jokingly donned a Batman mask atop his young schoolboy outfit for on-set photographers, while Bicondova looked even less removed from the future Catwoman. Finally, additional set photos also give us a pretty glaring insight into what the death of Thomas and Martha Wayne will look like, including the thief who kills them. FOX’s ‘Gotham’ will explore “the origin stories of Commissioner James Gordon and the villains that made Gotham famous,” with its pilot featuring Gordon’s investigation of the murders of Thomas and Martha Wayne. The pilot will also be written and executive produced by ‘The Mentalist”s Bruno Heller, along with Warner Bros. Television, and directed by ‘Judge Dredd’ helmer Danny Cannon. It has been confirmed that ‘Gotham’ will not have any direct ties to Ben Affleck‘s take on the Dark Knight for ‘Man of Steel’ follow-up film ‘Batman vs. Superman‘ or The CW’s ‘Arrow‘ series. Cast in other known roles thus far are Donal Logue as Detective Harvey Bullock, Jada Pinkett Smith as gangster FIsh Mooney, Drew Powell as her associate Butch Gilzean, ‘Burn Notice‘ star Zabryna Guevara as Gordon’s GCPD boss Captain Essen, and Erin Richards as Gordon’s fiancée Barbara Kean. We're not yet entirely sure what to make of FOX's 'Gotham,' but the characters look fairly true to the source material thus far. Check out our first look at Bruce Wayne and Selina Kyle in the photos below, and tell us what you think of FOX's 'Gotham' in the comments! Source: FOX’s ‘Gotham': First Look at Bruce Wayne, Our New Catwoman and a Major Scene on Set!